Santee's Granola is most famous for its home made taste. Our granola tastes so good it sells 10 times better than the average flat tasting granolas sold at one health food store. 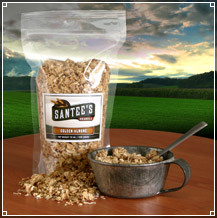 The owner reports that in addition to preferring our wholesome great tasting granola, many of his customers also buy Santee's Granolas to liven up the flavor of the bland granolas they are accustomed to eating. Give our granola cereal a try. Whether you eat it as a breakfast cereal, sprinkle it over fruit salads, puddings, custards, ice cream, or frozen yogurt, we're sure you'll love the taste too.